By Peter Anderson 6 Comments - The content of this website often contains affiliate links and I may be compensated if you buy through those links (at no cost to you!). Learn more about how we make money. Last edited March 27, 2015 . Several years ago my wife and I were part of a church small group. One couple in the group raved about a financial course they had recently taken called Financial Peace University. They told us about how it had helped them to get rid of all their non-mortgage debt, and how their outlook on money and life had completely changed. We were all intrigued of course, and after that same couple announced that they were going to be facilitating the class through our church, the entire small group decided to sign up. That Financial Peace University class was instrumental in helping to change our ideas about our money as well, and while we were taking that class I ended up starting this blog to share some of the things we were learning. We learned all about planning ahead for our future, saving up an emergency fund, and being “gazelle intense” while dumping debt. The Legacy Journey: What's It All About? 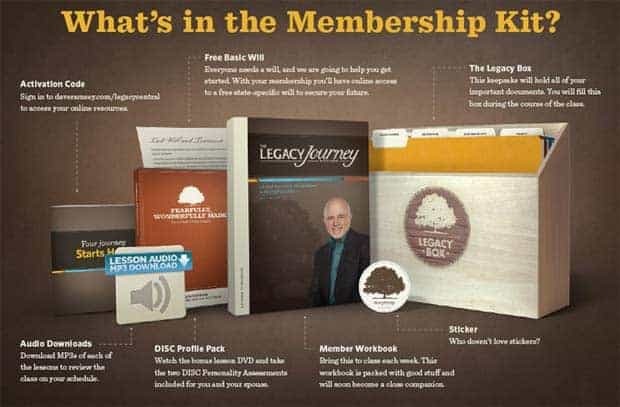 What's In The Legacy Journey By Dave Ramsey Box? The Legacy Journey: What Will You Learn? Over the years I've written quite a bit about Dave Ramsey and his teachings, and one post in particular, about Dave's beautiful new house, sparked a discussion about wealth, stewardship and giving. After several commenters questioned his intentions and attacked his views on wealth in general, Dave himself actually responded to the post. Dave's comment created a lively discussion, and after the post had spawned a flood of online commentary on other websites and on TV and radio, I had the chance to speak with Dave himself on the phone, at his invitation. It was a lot of fun getting to talk with him, and in speaking with Dave my understanding was that he wasn't completely satisfied with his response on my site. It's hard to explain your full thoughts on wealth, faith, stewardship and generosity in an online blog comment after all! To truly get the full idea about how he feels about wealth, stewardship and leaving a legacy for your family, he suggested you could take a look at his newest book and 7 week course, The Legacy Journey. When he offered to send a copy of the book and course to me at no cost (Thanks Dave! ), I jumped at the chance review The Legacy Journey. 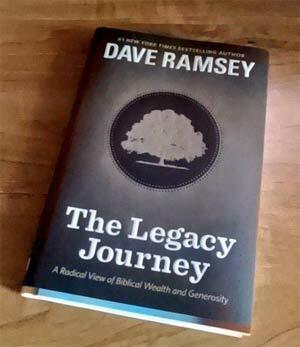 Let's take a quick look at The Legacy Journey by Dave Ramsey. While The Financial Peace University class is all about getting out of debt and staying out of debt, and starting down the path to living a financially free and responsible life, The Legacy Journey class is all about the next steps. It's about learning how to grow your money, manage it responsibly, and share it generously to impact the world. According to Ramsey, while “Financial Peace University is about waking up, The Legacy Journey is about growing up”. It's about learning to handle money God's way, and learning to be faithful with the much, just as you're called to be faithful with the little. So The Legacy Journey is all about taking that next step after you're out of debt. It's about building wealth, realizing your responsibility as a steward of what God has given you, and making a plan that can help you to impact your family, your community and others around the world. What's included in your The Legacy Journey class package when it arrives? Member Workbook: A Legacy Journey workbook is included that you'll be using each week as you attend the class. Audio Downloads: Download MP3's of each lesson to review the class at your leisure. The Legacy Box: You'll receive a keepsake box that will eventually hold all of your important documents that you create during the class, like your will. DISC Profile Pack: You'll receive a bonus lesson DVD and two DISC Personality Assessments for you and your spouse. Activation Code: You'll receive an activation code that will give you access to all the online materials at daveramsey.com/legacycentral. Free Basic Will: Everyone needs a will and you'll get online access to create a free state-specific will. Along with the course Dave Ramsey has also released a new book, “The Legacy Journey: A Radical View of Biblical Wealth and Generosity“. The book goes through many of the same lessons included in the class, while also adding in a few new stories and concepts as well. So what lessons will you find in the class? There are 7 core lessons that are included in the Legacy Journey class. Snares and Dares: This lesson takes a look at what Dave calls “toxic beliefs society has about wealth”, and delves into what the Bible has to say about wealth and faithful stewardship. The Pinnacle Point: This lesson is all about investing. It covers the pros and cons of stocks, bonds, mutual funds, annuities and real estate investing. The Law Of Great Gain: In this lesson Ramsey looks at the keys to contentment, and how to figure out how much is enough. He'll also look at how to create your own ratios for increased giving, investing and lifestyle. The Road To Awesome: Jon Acuff explores the five stages of an awesome life. Topics covered include purposeful living, mastering your talents, guiding others, and more. Safeguarding Your Legacy: Leaving a legacy for your family and future generations is important. Dave's daughter Rachel Cruze joins him to explore the importance of choosing to bless your children, and how to ensure you pass down a worthwhile legacy. Generational Legacy: What does the Bible say about material possessions and wealth? Topics explored include basic estate planning and generational wealth. Called To Generosity: Living out a legacy of generosity and kindness that God has given us is key. This lesson talks about how you can become more generous and use the resources God gives you to further the kingdom for generations to come. Fearfully, Wonderfully Made: This class will talk about the four basic personality profiles, and then look at how our understanding our differences can improve our communication. The lessons should give a comprehensive overview of how you take the next steps in your financial journey – setting you on the road to building wealth and giving you a solid foundation in Godly contentment, generosity and love that you can leave as your legacy. The Legacy Journey by Dave Ramsey promises to be an interesting class that adds and expands upon the lessons you've learned in Financial Peace University. FPU gets your journey started by helping you to change your money mindset, dumping debt and starting to invest through it's 7 baby steps. The Legacy Journey reviews what you've learned in FPU and then builds upon it, looking more in depth at building wealth, investing and God centered stewardship and generosity. It helps you to make sure that you're building wealth for the right reasons, and encourages you to live generously and leave a legacy for your children and future generations. I haven't been through the entire class quite yet, but plan to go through it all in the coming weeks. I'll do a review of The Legacy Journey course and book once I'm done and share my thoughts in a future post. From what I've seen thus far, however, it promises to be another engaging and edifying class. Find more details about The Legacy Journey, or purchase your copy of the class materials or home study kit, click through from the link below. 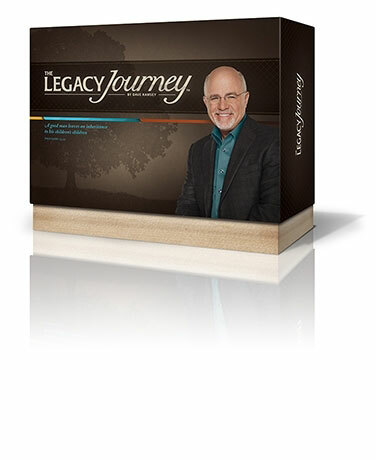 Get The Legacy Journey by Dave Ramsey Now! The links to The Legacy Journey site are affiliate links, and I will receive a small commission if you sign up for the class or home study kit. I do, however, actually use Dave Ramsey's products and only recommend products that I believe in on this site. Last Edited: 27th March 2015 The content of biblemoneymatters.com is for general information purposes only and does not constitute professional advice. Visitors to biblemoneymatters.com should not act upon the content or information without first seeking appropriate professional advice. In accordance with the latest FTC guidelines, we declare that we have a financial relationship with every company mentioned on this site. I can completely understand needing to not be quite as gazelle intense, it could be draining, especially if you’re working part time jobs/etc trying to pay off a large amount of debt. I have friends that went through FPU who took a bit longer and didn’t get as intense about it. But they still were constantly paying off debt, and working their way towards debt freedom. Getting out of debt is still getting out of debt -no matter how long it takes! My husband and I are excited to read this new book. We’ve always been Dave fans but haven’t completely fit with the stereotypical deeply indebtedness of the other books. The steps work regardless of where you’re at, but the idea of working on building a legacy jives with our stage well. I like that it includes a will. I’m excited for this one as well. Since we’ve moved beyond the get out of debt stage, this Legacy Journey seems to line up a bit more with where we are as well. When I started working as a VA for a personal finance blogger, I don’t have any idea who Dave Ramsey was. When I searched for personal finance quotes, however, Dave’s name always appeared and after I had read his life story I became a big fan.